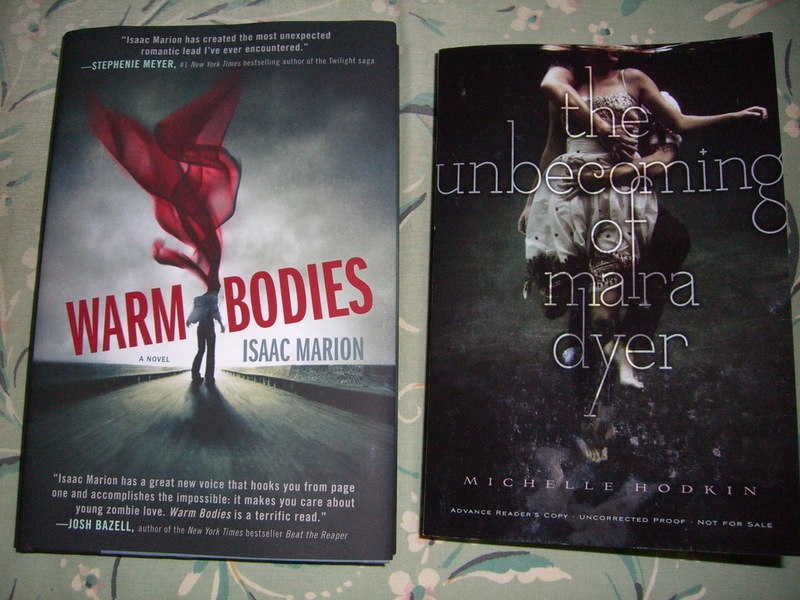 I have ONE copy of the US hardcover edition of Warm Bodies to give away, thanks to the Book Blogger Convention. This is the one with the pretty cover above! 1. 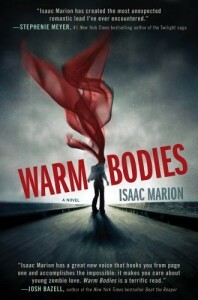 Email janicu[at]gmail[dot]com with the subject WARM BODIES GIVEAWAY, and say “please enter me” or something like that, and that should be it. No hoops, although if you found this blog via this giveaway, I’d be thrilled if you did subscribe. 3. This giveaway is INTERNATIONAL. I’ll mail it anywhere that the USPS delivers to. I’ve mentioned to people before that I’m not a fan of zombies, but when I was pitched this book to review on my book blog by Atria Books, I couldn’t help being intrigued. A love story with a zombie protagonist? 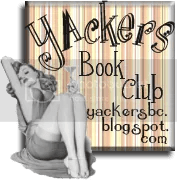 I did a little checking and loved the voice in the excerpt (link is to a .pdf file), and before long I’d accepted a review copy, despite my zombie-dislike. The Premise (blurb is from the publisher, since it describes the story very well) : “R is a young man with an existential crisis–he is a zombie. He shuffles through an America destroyed by war, social collapse, and the mindless hunger of his undead comrades, but he craves something more than blood and brains. He can speak just a few grunted syllables, but his inner life is deep, full of wonder and longing. He has no memories, no identity, and no pulse, but he has dreams. My Thoughts: The reason I don’t really like zombies in my fiction is that they’re generally in there for horror purposes – they moan and shuffle and they kill, so there’s lots of gore and eating of brains. They’re typically not the protagonist, nor are they prone to sensitive thoughts when they are. This just isn’t my thing, but Warm Bodies surprised me by going against this grain. Told from the first person perspective, Warm Bodies describes the unlife of R, a zombie with a rich inner world. R is unsatisfied by the way things are, and searches with seeming futility for something more beyond an existence that is just mindless repetition (killing, standing around, occasionally sleeping). He’s deeply introspective. He makes gently humorous observations about his ‘”life”. He wants to know who he was and what he did before he died. He has a friend (“M”) whom he converses with (albeit in slow, low syllable sentences). He feels torn about eating people. R is incredibly articulate on paper despite his verbal incoherence (R’s “personal record is a four rolling syllables before some …thing…jams”), which is a big part of what makes his story compelling and readable. He’s different from the undead stereotype, and his uniqueness makes his follow zombies eye him with a certain degree of discomfort. Outsider status aside, it is difficult to see R as a hero or romantic lead until he kills a teenager named Perry Kelvin. R experiences the scraps of Perry’s memories and his love for girlfriend Julie. It’s normal for zombies to see visions of their victim’s life, but R has never had a vision like this. Instead of killing Julie, R is compelled to keep her safe. Once Julie enters the story, her interactions with R slowly but surely move the story in a more hopeful direction. R’s sweet gestures and shy courtship and Julie’s bright view of the world despite it’s bleakness, had me in rooting for them, but it is well-balanced by the dark and gritty environment. There are also those who don’t like change in any form who see their relationship as a threat to the way things are, and there are many tense moments when Julie and R are confronted by them. Although I would put “character” down as the greatest strength of Warm Bodies, (both primary and secondary characters were well fleshed out), I was impressed by the world building as well. There is a great sense of setting – the airport that is the ‘home base’ of the zombies and the sometimes surprising activities there (zombies go to church, don’t you know? ), and on the flip side, the stadiums which have become the last refuge of the living. It fascinated me to read how society has coped with zombies and how children are raised in this new world. I even liked the ending. It may push against your suspension of disbelief, but I found the conclusion completely satisfying. Any complaints I’d have are nits. One is a small inconsistency in R being unable to read early in the book but I’m not sure if I misunderstood this. The other is that I’m not sure whether or not R really gives the reader an explanation for the zombie outbreaks, which some readers may dislike. As it was, I preferred the ambiguity. Overall: Zombies usually aren’t my favorite supernatural creature and I never expected to believe in a zombie hero, but I liked Warm Bodies. R’s voice is so sensitive and eloquent that I found myself rooting for him to get the girl and save the world. The romance works, and is incredibly sweet to boot, but the story also doesn’t shy away from describing the new realities in a post-apocalyptic landscape. I really enjoyed this fresh take on zombies: recommended. In other news – Warm Bodies is being adapted into a movie. The Internets tell me that it’s being directed by Jonathan Levine and will star Nicholas Hoult (of About a Boy and X-Men:First Class fame) as R.
Andd… Warm Bodies is a book that was being given away at the Book Blogger Convention, and I snagged a couple of extra copies. One is going to a friend, but the other is up for grabs in a giveaway! I’ll be putting that post up in a bit.